This is a book review of Destroying Libya and world order: The Three-Decade U.S. Campaign to Terminate the Qaddafi Revolution by Francis A. Boyle. ISBN: 978-0-9853353-7-3. This book gives us a perspective that no newspaper can on the repetitive accusations against Eastern and Middle Eastern states of weapons of mass destruction, chemical weapon stockpiles and airplanes falling out of the sky. It tells of Colonel Muammar Qaddafi's legal fight to defend himself against US and UK allegations of being responsible for the Lockerbie Aircraft bombing in 1988. Libya filed two World Court lawsuits against the United States and the United Kingdom at the International Court of Justice in The Hague to convene an emergency meeting of the World Court and to request the Court to issue the international equivalent of temporary restraining orders against the United States and the United Kingdom so that they would not attack Libya again as they had done before. After these two World Court lawsuits were filed, President Bush Senior ordered the Sixth Fleet to stand down. Thus Libya managed to avert war with the United States. Because of these legal suits, as Francis Boyle records, "There was no war. No one died." Unfortunately that was not the end of NATO attempts to bring chaos to the Middle East and war to the world. Boyle describes how, time and again, the United States would invade Libya's coastal waters and attempt to draw fire. The US seemed to make up the law as it went and NATO went along with it all. Qaddafi followed Francis Boyle's legal advice and documented Libya's peaceful responses in world legal forae. You would think, reading of these considered documents, that the US, the UK, and NATO would have desisted for fear of being tried for war crimes. But they did not. They went further to support Qadaffi's enemies who pursued Libya's leader with guns and knives and killed him along with about 60 of his supporters, in a war-crime as yet officially uninvestigated. One concludes that the leaders of the countries involved truly believe they can get away with anything. They must think they are beyond punishment. Francis Boyle describes Colonel Qaddafi's rule as 'secular-nationalist'. He decreed that women in Libya were equal to men. He wrote a 'Green Book' that attempted to find a third way between capitalism and communism, consistant with Islam. Although most Libyans were moderate Sunni Muslims, Qaddafi's biggest opponents were Muslim fundamentalists in Libya itself. 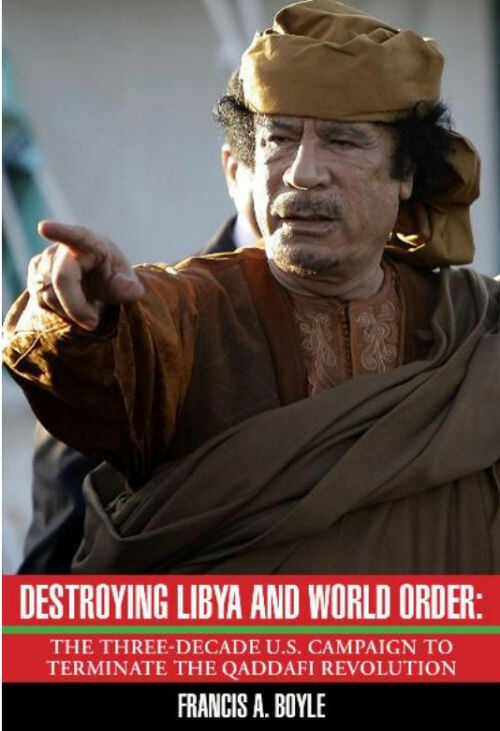 In order to overthrow Qaddafi in 2011, the U.S. and NATO states worked hand-in-glove with Libyan and imported foreign Muslim fundamentalists including elements of Al Qaeda and Salafists. There were many assassination attempts by the West and, in 2011, when the bombing of Libya campaign began, Qaddafi went to ground, trying to stay alive. Eventually he was assassinated in the most brutal way, defending his country. In the wake of his removal, Libya has fallen into chaos. Extremism of the most brutal kind has sprung from this chaos, radiating outwards. This was not the fault of Qaddafi, but of the international forces that armed his enemies. Francis Boyle explains how the doctrine of Responsibility to Protect evolved to be abused. In 2011 the Obama administration directly took over Libya’s oil fields under the pretext of the so-called Responsibility to Protect doctrine. AUTHOR FRANCIS A. BOYLE is a leading American expert in international law. He was responsible for drafting the Biological Weapons Anti-Terrorism Act of 1989, the American implementing legislation for the 1972 Biological Weapons Convention. He served on the Board of Directors of Amnesty International (1988-1992), and represented Bosnia-Herzegovina at the World Court. He served as legal adviser to the Palestinian Delegation to the Middle East peace negotiations from 1991 to 1993. The 2011 U.S./NATO War Against Libya. The Spec has a short memory. In 2011, the North Atlantic Treaty Organization (NATO) bombed Libya mercilessly for seven months. The United Nations Security Council had authorized a no-fly zone over Libya, which NATO abused into a regime change operation. Libya, which had the highest standard of living in Africa, was utterly devastated and turned into a failed state. Hundreds of thousands were killed, maimed, and turned into refugees. Hillary Clinton gloated over the assassination of Colonel Gadaffi, quipping, "We came, we saw, he died!" Canadian planes and ships took part in this illegal military intervention, despite warnings by senior staff that overthrowing Gadaffi would open the door for terrorists into Libya. Later, some officers joked privately that Canadian jets were "al-Qaida's airforce." Now, the USA is bombing Libya again. We don't believe it's to stop ISIS. After all, the USA is responsible for creating ISIS by creating power vacuums in Iraq, Syria, and Libya. It also admitted that its weapons and fighters it has trained have ended up with ISIS. We also don't accept the legality of the militia fighting for power in Libya, from which the USA supposedly derives authorization to bomb the country: it's not up to the USA to overthrow governments it doesn't like and replace them with compliant regimes. It's time that the U.S. removed its dirty hands from the whole Middle East. And it's overtime for Canada to quit NATO so as not to be dragged into every war of the U.S. Empire. Thanks for the article Sheila. I read Francis A. Boyle's book some 12 months ago and it rammed home to me the sheer belligerence and stupidity of the US, the UK, NATO and our own Federal Government. Most Australians are, as you infer, totally unaware of the facts behind the news and are bewildered when they are reminded that what they see, hear and read is, in fact, not true. I continually challenge Fairfax Media on some of the articles they print although rarely do they re-print any of what I write. I recently rebutted a piece by Paul McGeough "We have to consider the idea that Donald Trump is more stupid than he let's on..." with a blunt "Only those who are incredibly stupid would consider Donald Trump to be stupid!" This is what passes for journalism in todays mainstream media. While dear Donald may have more than the odd idiosyncrasy or two and whether you like the man or not, I don't believe him to be stupid. Whereas, The Age, is irresponsible for printing such an article, but then of course they are firmly wedged in the Clinton camp as we well know. Therein lays the problem. The mainstream media are all pumping for Hilary Clinton to make it to the White House ignoring the fact that WW3, or the equivalent thereof, may be on her agenda. Those of us who are enlightened to Hilary's belligerence know only too well what she is capable of with unfinished business in Syria, The Ukraine and maybe Iran to come.